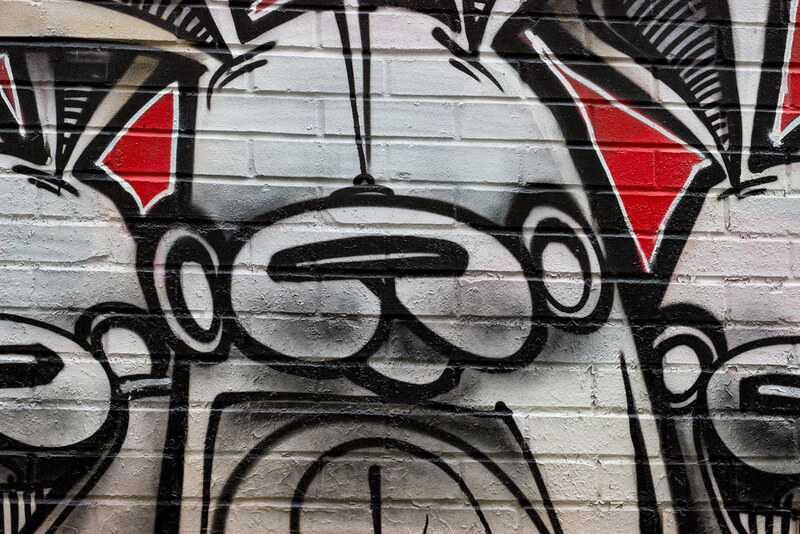 Toronto is home to some really cool street art and we spent the day exploring some of it. We started out the day by eating some delicious banh mis and tacos at the Banh Mi Boys on Queen St W near Spadina. 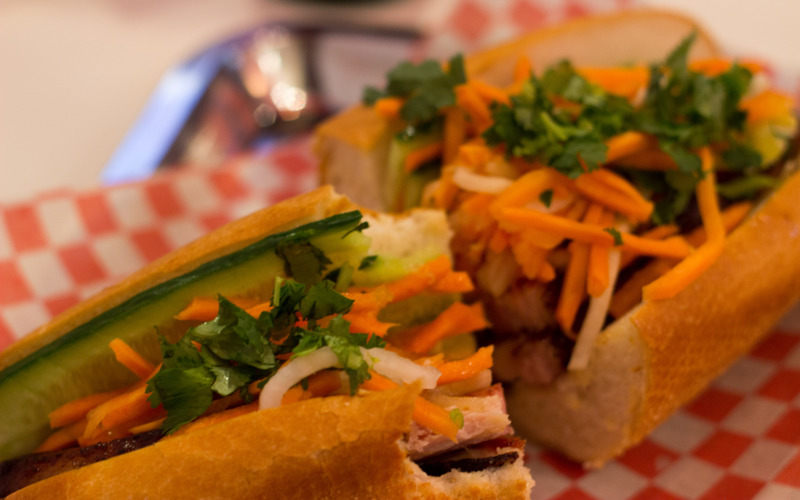 I got the pork belly banh mi, which came with pickled daikon, cucumbers, carrots, cilantro on a crispy baguette. The tacos were also really good and came with kim chi, cilantro, carrots and asian bbq sauce; you can get a choice of kalbi beef, pulled pork, chicken, squid, or tofu. Banh Mi Boys has a cool atmosphere; I like the nonstop 90s and 00s jams that they play here. We then walked about half a block to get to Graffiti Alley. It’s along Rush Lane and goes from Macdougall St and goes until Portland St. It’s super colorful and really amazing what people can do with spray paint. Funnily enough, we saw a pristine white Benz parked along the graffiti. After visiting Graffiti Alley, we sort of freely wandered to Kensington Market. There are lots of walls filled with street art in the area between Graffiti Alley and Kensington, so just wander around and I’m sure you will see something interesting. 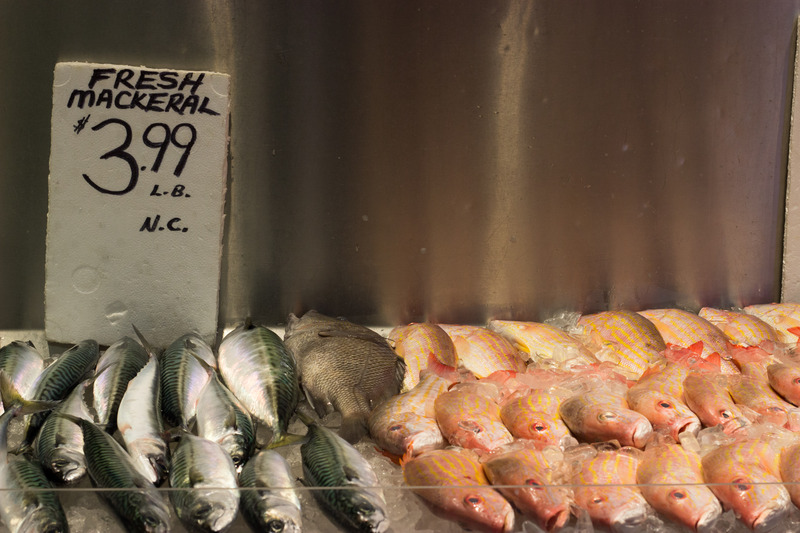 Kensington Market is a really fun place filled with vintage shops, Mexican food, grocery stores, and fresh fish stores. In the summer, the street is closed to vehicular traffic on Sundays and there are many open-air booths to buy crafts as well as street performances. Our final stop on the street art wander was 52 McCaul St. To get from Kensington to 52 McCaul, you will have to walk past the Art Gallery of Ontario, which looks really cool on the outside (partially designed by Frank Gehry and free on Wednesday nights), and the Sharp Centre for Design, which is part of OCAD University. The Sharp Centre looks to me like a building balanced on pencils and is one of my favorite pieces of architecture in Toronto. There are two pieces of really large street art at 52 McCaul. The one of a man among waves was created as part of the Manifesto Festival. If you want to see more awesome street art, you can go to the Ossington Laneway, which is near Ossington St between Queen St W and Humbert St. But we got a bit tired, so after our walk we went to the Russian sauna and you can read this post if you want to learn more about the sauna.